In the spirit of exchange and reflection, Skol invites the public to participate in Journées Paroles et Manœuvres. A cross-disciplinary meeting of interventions, conferences, performances and discussions, this event aims to inverse roles, to encourage collaboration between different types of expertise and to support hybrid forms of communication. Journées Paroles et Manœuvres is an opportunity to take time, together, through various forms and ideas. “16 May 2015 2:01 p.m. That day, they met in a studio located in a building downtown. She had come to the coffee shop, where he waited under the awnings. “Hi,” he kissed her, “Are you all right? “. Far away, the sound of bombing was tearing down the sky. Closer, men stood at the end of their weapons feeling the anxiety together. The land was enduring. “Well, she answered, I hurried, the electricity was cut off. What about the others? “” Some have arrived already. Anything new? “” Yes, I’ll tell you about it but let’s get to them first”. Thus they got together with the desire to live yet for another night, to make music, and for the others to read and write. On the night of July 16, 2006 in Beirut, Mazen Kerbaj recorded an improvisation piece on the trumpet that develops with the sound of destruction. 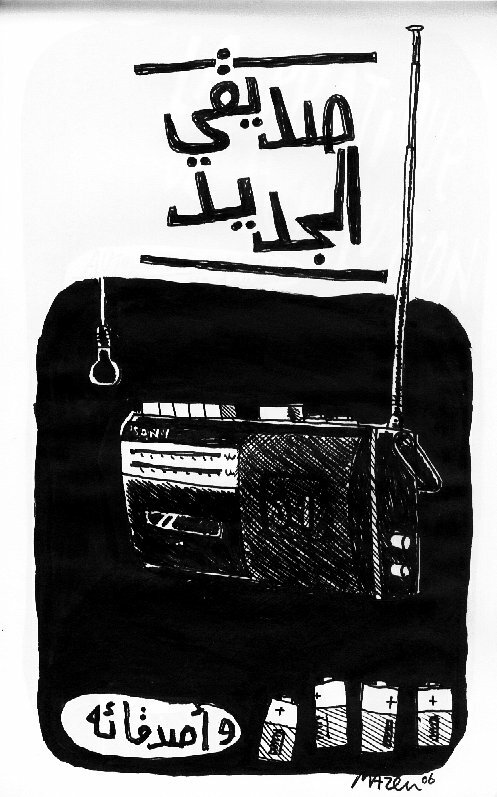 A performance that deals with war through the narration of the experience of a night during the Lebanese civil war. The conference will present synthetically the main causes of the current tensions in the Arab World. The historical focus will allow for a better understanding of the origins of these conflicts and explain their evolution. Monia Abdallah – The War Regime in the Silence of Peace. Reflections on a Selection of Contemporary Artworks. Recent books on contemporary Middle-Eastern art as well as exhibition catalogues have certainly helped introduce the theme of war into the contemporary art from the Middle East around the notions of conflict, history and Identity, but they don’t address specifically the issues raised by implicit relationships between these concepts. Various career paths that artists shown here had and their respective ways of representing the war will make us question the distinction so quickly acknowledged between the art of the diaspora and the art created in the country at war, in this case Iraq: does that distinction make sense when it comes to the expression of war and its aftermath? The highly censored footage reveals an Israeli military training exercise that took place in 2007 in the Negev prison, where hundreds of Palestinian political prisoners are held, mostly without charge or trial. Target consists of tens of still photographs of posters and found portraits of Palestinian leaders, intellectuals, and activists who were assassinated inside the occupied Palestine and across the world. Scenes of everyday life in occupied Palestine, filmed in a 1960’s home-movie style, creating a sense of irreality. Instead of a day at the beach or at the park: a wall, an olive tree, a bulldozer and soldiers harassing grandmothers. Radwan Ghazi Moumneh is proposing a musical project that addresses the experience of the ephemeral in a performative context, presenting a reiteration of the contemporary culture of the Levant. Monia Abdallah is a professor of art history at the University of Quebec in Montreal (UQAM, Canada). Her recent research focuses on artistic practices in the Middle East. She defended her doctoral thesis at the Ecole des Hautes Etudes en Sciences Sociales (EHESS), which was entitled “Building the continuous progress of the past investigation of the notion of contemporary Islamic art.” Her publications study the links between art, Islam and Modernity. Mirna Boyadjian holds a master’s degree in Art History from UQAM. Her thesis project focused on Taryn Simon’s photographic work. In February 2015, a four-part version of her thesis appeared in the Parisian web Magazine Jeu de Paume. She writes articles for various art journals, and she recently co-organized a day-long study event at DHC-ART on the connections between aesthetics and politics in contemporary art. In September 2015, she will begin her PhD in Art History on the sonic elements (music, noise, voices, etc.) in representations of conflict in the art of post-civil war Lebanon (1990-2014). Serge Cardinal is a professor of cinema at the Department of Art History and Film Studies at University of Montreal. He leads the research-creation laboratory La création sonore : cinéma, arts médiatiques, arts du son, www.creationsonore.ca. He is a member of the interdisciplinary Observatory of creation and musical research (l’Observatoire interdisciplinaire de création et de recherche en musique). Mary Ellen Davis is a documentary director. He first short film was Nelson Symonds Jazz Guitarist. and helped produce Alejandro (1994), by Salvadoran director Guillermo Escalon. In 2001, Davis releases a third documentary about Guatemala: Haunted Land. This documentary also receives local and international recognition. Since 1997, she works as program advisor for Montreal’s First Nations film & video program within Festival Présence autochtone. In 1999, Davis becomes part-time teacher at the Mel Hoppenheim School of Cinema (Fine Arts Faculty, Concordia Univ.). In 2007 Davis completes three projects: Territories, Los Músicos, and A Day in Palestine. Radwan Ghazi Moumneh is a Lebanese/Canadian musician, record producer and multidisciplinary artist living in Montreal. Focusing on morphing and re-interpreting Arabic music and culture, he presents his performances under the moniker “Jerusalem In My Heart.” He is the co-owner of Montreal Hotel2Tango recording studio, and releases his albums on Constellation Records. Raïa Haïdar is a lebanese and french actress born in Paris and raised in Gambia. She has starred in numerous short films, Jocelyne Saab’s What’s Going On? (2011), Dima El Horr’s Everyday is a Holiday (2009), Ghassan Salhab’s and The Last Man (2006). She has co-written, co-produced and co-starred in the play Who Killed Marilyn? Raïa Haïdar teaches acting to children and adults. She has also worked behind the camera as a production designer and set decorator. Born in 1975, Mazen Kerbaj lives and works in Beirut. His main activities are comics, paintings and music. Kerbaj published more than 15 books and many short stories and drawings in anthologies, newspapers and magazines in Lebanon, Europe, and the USA, and exhibited his work both in solo and in collective exhibitions in Lebanon, France, England, Spain, Sweden, Germany, Switzerland, Australia, Dubai, Malaysia and the USA. Mazen Kerbaj is also one of the founders of the Lebanese free improvisation scene, both as a trumpet player and as an active member in the MILL association that organizes the annual Irtijal festival (www.irtijal.org) in Beirut since 2001. Thomas Sinou was born in Marseille. In 2006, he immigrated to Montreal where he works as a sound designer and chief sound for festivals and concerts. Sinou designs various media devices allowing interaction between sound, space, actors, performers, spectators … In 2008, he founded the company L’eau du bain with Anne-Marie Ouellet where he acts as a sound designer and actor-performer. work has been shown in Canada and internationally in both group and solo exhibitions and screenings. Nazzal has received awards from the University of Western Ontario, Ryerson University and the University of Ottawa, as well as grants from the Ontario Arts Council, the City of Ottawa and SAW Video. Samir Saul is professor of History of International Relations at the University of Montreal. His interests are France and the Arab world. His investigations focus on the relationship between political and economic dimensions at the international level. In economic history, he studies the movement of capital, international trade and business history. He is a founding member and coordinator of the Groupement interuniversitaire pour l’histoire des relations internationales (GIHRIC).